Reading old texts about brewing in northern germany one stumbles upon beers called "Märzbier", "Kufenbier", "Erntebier", "Sommerbier" or "obergäriges Lagerbier". "Märzbier" (march beer): is brewed in march when the temperatures allow to brew a clean and durable top fermenting beer that keeps for months. 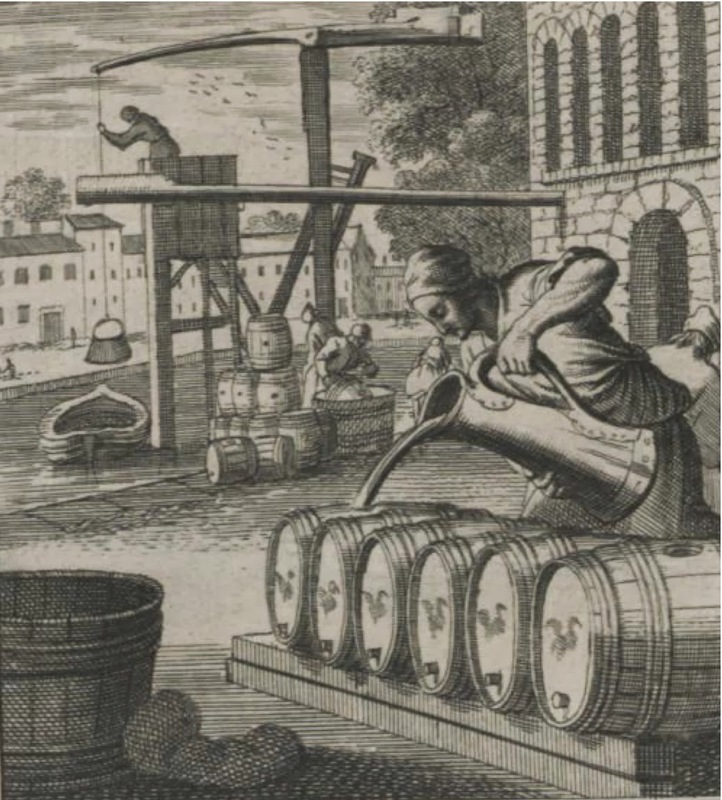 "Kufenbier": the beer was lagered in large wooden barrels called "Kufen". "Erntebier" (harvest beer) and "Sommerbier" (summer beer): Summer and harvest time are busy and bad time for brewing if you have no efficient cooling device and cool fermentation cellar so you brew a strong and durable beer in spring and serve it in the summer or at harvest time. "Erntebier" can also be a lower alcohol beer brewed fresh during the harvest time (for consumption at work). "Erntebier" was also a name for the celebration when harvesting was finished. All those terms describe top fermenting but lagered beers ("obergärige Lagerbiere"). It's a stronger version of an ordinary "braunbier". "double the amount of malt and triple the amount of hops". Braunbier with 1- 2 %vol. was made for prompt consumption. Knaus (1575) calls "Merze Bier" from Berlin and Magdeburg as a superior brew compared with the beers brewed in summer. During the hot season they had problems with chilling, fermentation temperatures, and cleanliness. The Köstritzer "doppelbier" (before it was called english) can be assumed to be a "Obergäriges Lagerbier". If you want a great description how to brew it read Munz (1840) "Das Bierbrauen in allen seinen Zweigen". But remember this type of beer is all about the process of lagering, it's no recipe. Every beer can potentially be a "lager beer" if it keeps its qualities (or improve) over a few months at cellar temps. On the other hand not every "Doppelbier" is also lagered. stored at cellar temps for at least 8 weeks. For commercial brews that go into the right direction I would try something like Uerige Sticke and Pinkus Alt.